Vigo brings a natural style to your home office, with a palette of elegant colour options and finishes that go beautifully together. Vigo lets you release your inner designer, allowing you to mix and match colours and finishes available for this fitted home office furniture range to create a work environment that’s uniquely yours. The options are endless and with everything made to measure, you can maximise your home office storage to stunning effect. File under ‘creative workspace’! The solution is in the detail. We take the experience into your home to ensure you’ll be over the moon with the way we utilise your space. It goes without saying that our installers are the best in the business. They are highly skilled individuals who take immense pride in their work. Imagine how you’ll feel when you step into your new room for the first time. Gone is the clutter. In its place is a beautiful new room, an oasis of calm with a look and style that is unique to you and you alone. Weâre very happy; we should have had it done years ago. Our designer will visit at a time to suit you; go through colours, styles and see your dream room come to life in 3D. The best way to experience our furniture is to see it for yourself in one of our showrooms. Get inspired with our latest catalogue and choose the furniture that can transform your home. Spring Sale. 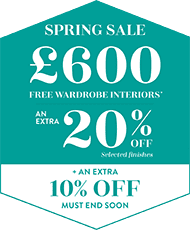 Save on the perfect space and the ultimate fitted furniture with our offers and exclusive discounts, for a limited time only.